Cross-device interaction is arguably one of the most difficult data points to track in your Google Analytics. Even with the release of the User ID feature, a login is still required and there is technical overhead required that makes it complicated. While investing in tracking users in Google Analytics is the best solution, paid search professionals don’t need to undergo such pain and technical hassles to gain the insight they need to perform their job at its best. Google AdWords tracks this information automatically and this cross-device activity can become a bliss-point if you know where to look in your Google AdWords account. The AdWords system measures this cross-device activity by aggregating anonymized data from Google users who have previously signed into Google services on each of their devices. Using granular user-centric data the AdWords system is able to provide a depth of reporting without compromising the privacy of users. Device reporting is a great reason visit the Conversions section of your account more frequently than you probably do. The attribution reports you find there are a valuable resource to gain insight into your overall reach and how ad interaction is influenced by user behavior. Let’s take a look at three reports that are often overlooked in lieu of the day-to-day reporting and optimization of your AdWords campaigns. It doesn’t matter whether you’re tracking conversions with the AdWords conversion tag or importing your Google Analytics goals, these reports will enhance your depth of knowledge either way. Plus, if you’re not already tracking users in Google Analytics this is a nice alternative to better understand the ways in which your valued customers reach your web property. 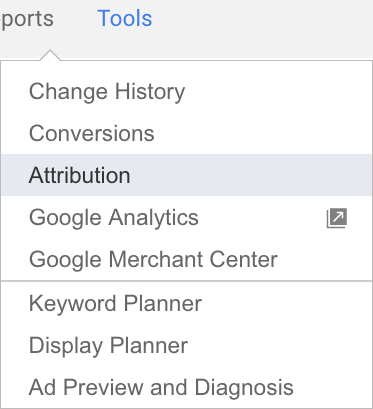 Visit the “Tools” menu item in your main navigation and select “Attribution” from the dropdown. TA-DA! You’ll be presented with an overview of your account and a breakdown of your conversion types along with behavior-focused metrics that provide insight into your consumers’ behaviors. You see how long (in days) that it takes for users to convert along with the number of ad interactions they experienced on their paths to conversion. This information is great by itself, but I used a key word in that previous statement – path. By digging a little deeper, you will be able to gain more insight into user experience and, literally, how consumers arrive at their decisions to complete your sought after business goals. Your ad clicks and impressions, along with days to convert, are ultimately influenced by the devices used to find your product or services. Let’s take a look at how Google AdWords breaks down this overview into more actionable insight. Now, take a look at the navigation menu on your left. 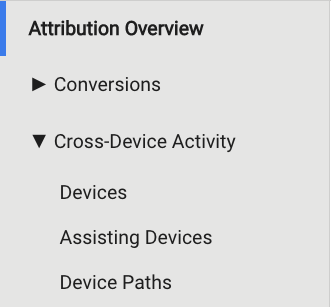 Click the dropdown for “Cross-Device Activity” and you will find three very helpful AdWords reports the can influence your decisions on how you approach targeting various devices. The devices report provides advertisers with a summary detailing the percentage of total conversions impacted by cross-device behavior. 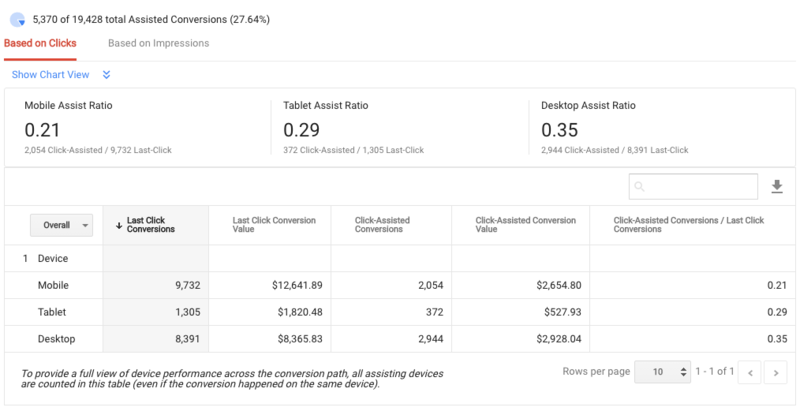 The table toward the bottom of the report then details on which device the AdWords ads were interacted with versus on which device the conversion actually took place. This breakdown provides additional insight into the aforementioned “days to conversion” or “clicks/impressions per conversion” by demonstrating that users didn’t make their conversion decision in the moments immediately following the ad interaction. From this report you can see that many users first interacted with an ad on one device, then some time passed before they switched devices and ultimately completed the conversion. The assisting devices report goes one step further by breaking down assisting device data against total assisted conversions to give you insight into how device-specific interactions impact the whole of the account by demonstrating the frequency at which these sorts of user behaviors take place. This device attribution report helps to assign conversion value to interactions that took place some time prior to the actual conversion date. While the Devices Report provides context into different types of interactions, this report assigns those interactions a weighting conversion value dependent upon the device’s position in the conversion path. We can see that there is some value in “early” clicks and, perhaps, these conversions do not occur without the initial nudge on the device that the user first expressed their interest via a search. Finally, we have AdWords Device Paths report itself. This report breaks away from the typical data tables we saw in the other reports and allows you to visualize the ways in which users are reaching their conversion point by showing the steps [devices] taken ahead of the conversion. It also quantifies these behaviors and assigns a conversion value to the type of interaction to demonstrate the most frequent and most valuable paths to conversion. In today’s internet it is naive to think that users are confined to the use of a single device in their search for goods and services they desire. Users [customers] want what they want when they want it, and you need to be there when they first express interest. By attributing value to users across devices, we begin to think bigger picture about our marketing investments. Device attribution reports provide a holistic view of your AdWords campaigns and can provide greater detail into how your Google AdWords strategy has unfolded over time. Think about assisting interactions in the context of your total campaign costs and think about your investment at a per-click level. When you zoom out and view your account at this scale it makes it easier to justify certain CPCs and bid adjustments. You might be inclined to bid more aggressively for mobile traffic if it tends to be a big initial awareness driver and influences many last-click conversions across devices. These reports help to put your strategy in context, understand the behavior of your consumers, and make a real strategic impact on the overall performance of your Google AdWords account.